THC brand high quality transmission roller chains include mainly European / American standard micro / short / double and long pitch chains for drive and transmission applications. A wide line of derivative versions are available for difference applications. 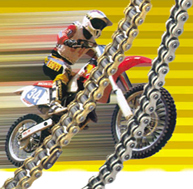 The quality of THC brand motorcycle chain meets that of world-famous brand you care to name, especially that of high performance o-ring motorcycle chain, low friction x-ring motorcycle chain and motorcycle silent chain. Samples are available for quality test and confirmation. Read before Inquire | Tel: 86-10-8795-2546 | Fax: 86-10-8795-2541 | E-Mail "THC"
Copyright 1998-2010 by Beijing THC Limited. All rights reserved.